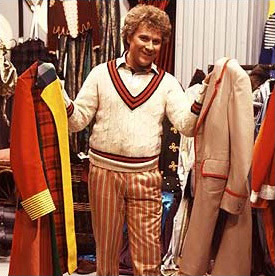 The costumes on the racks are an ecclectic mix of stock items probably from the Angels or BBC Cosutme Department roped in for the day, but hidden in there are a number of pieces of previous Doctor’s clothes. Patrick Troughton is represented by the fur coat he wore in The Five Doctors, and if you look closely, you’ll also see his trousers from the same story hanging by their braces on the wall at the back (see right). 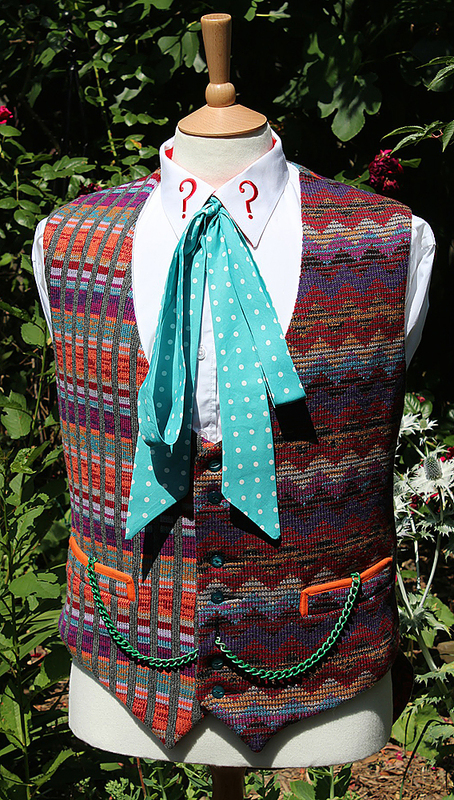 Elsewhere, there are a couple of bits of Jon Pertwee’s costume, again from The Five Doctors. On the rack is Jon’s tartan Inverness Cape (see below, left); and later Colin Baker tries on the Smoking Jacket (see below, right). 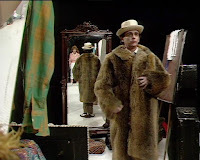 It wasn’t too long before The Doctor was back for another rumage for clothes, in the form of Sylvester McCoy. 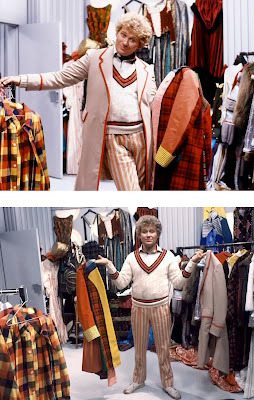 You can see some more detail of the background costumes, though no extra Who-related ones sadly. 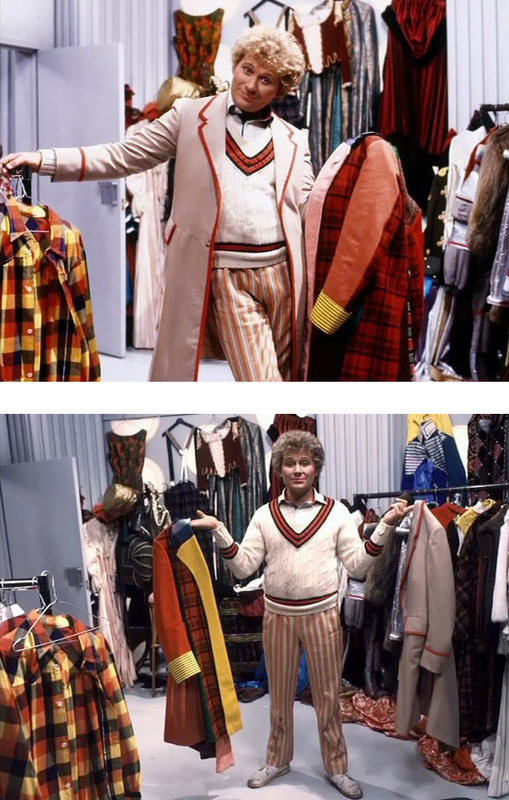 I think that if we had the few seconds of video, we'd see that there's (just) slightly more to Patrick's costume change. 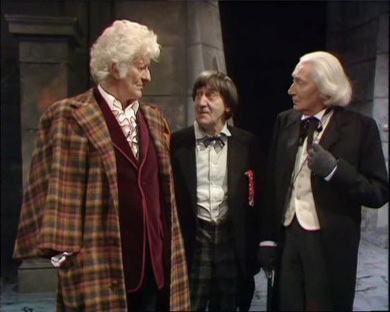 It could just be a matter of throwing the first doctor's cape to the ground. 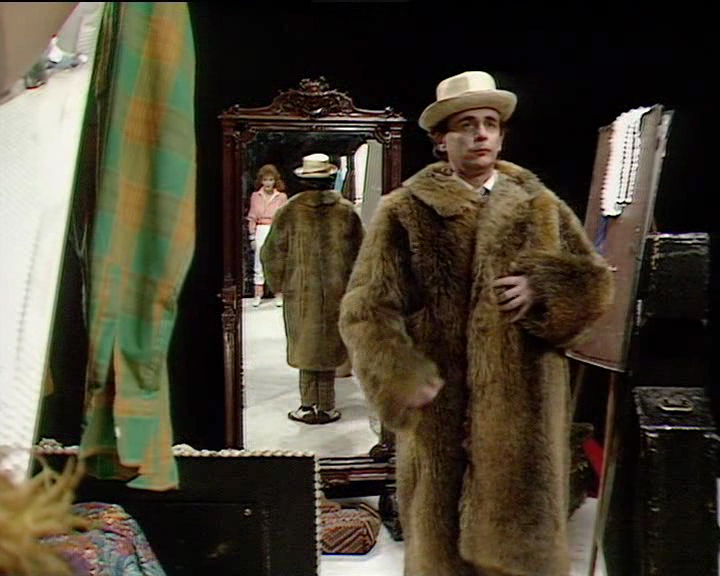 But he gets the coat somewhere, as he doesn't have it initially. He digs through a chest for a few seconds. 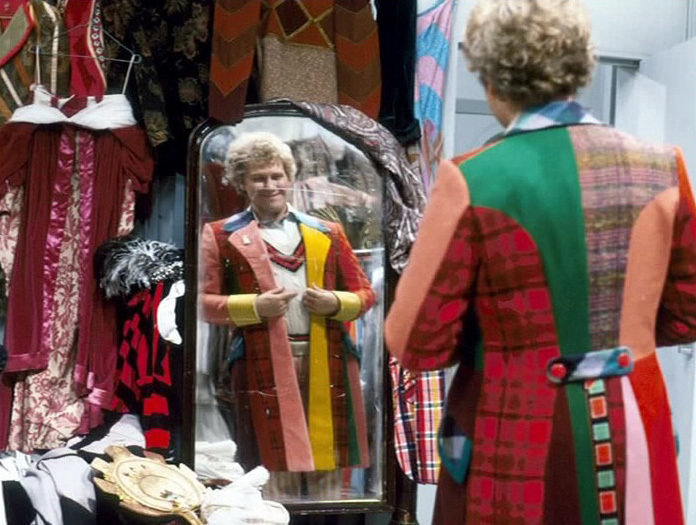 I assume he is looking for the mirror, but does he also get his coat here? 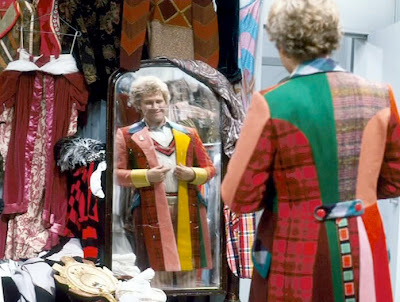 Another minor detail: He discards the first doctor's ring, and Polly picks it up. 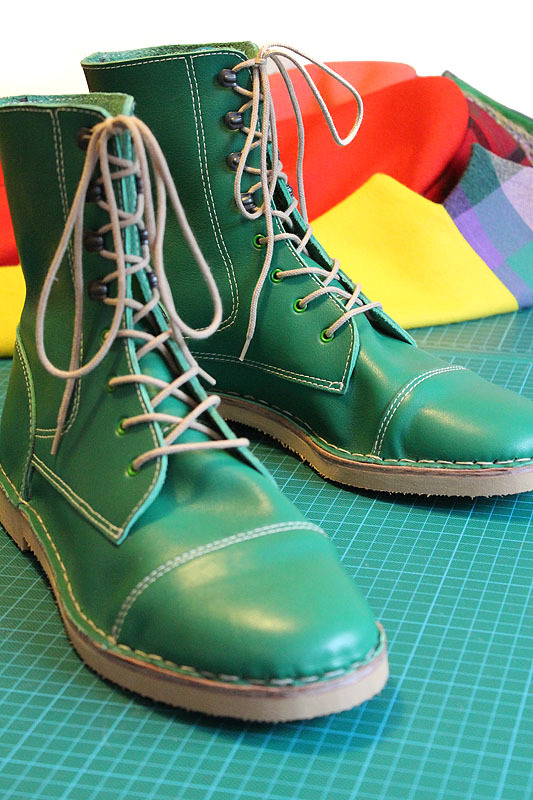 Just nit-picking. But that's what we do, right? 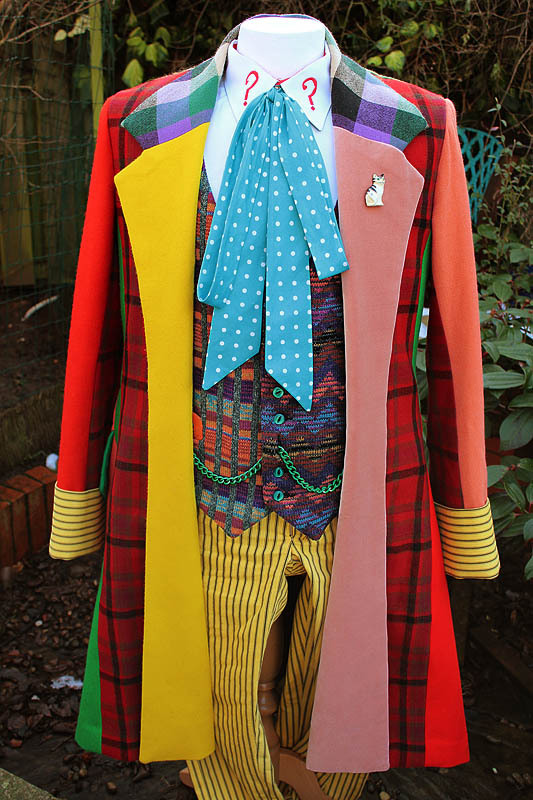 @fourknocks - would you like to repost your comment under the Tenth Doctor Costume Transition entry? 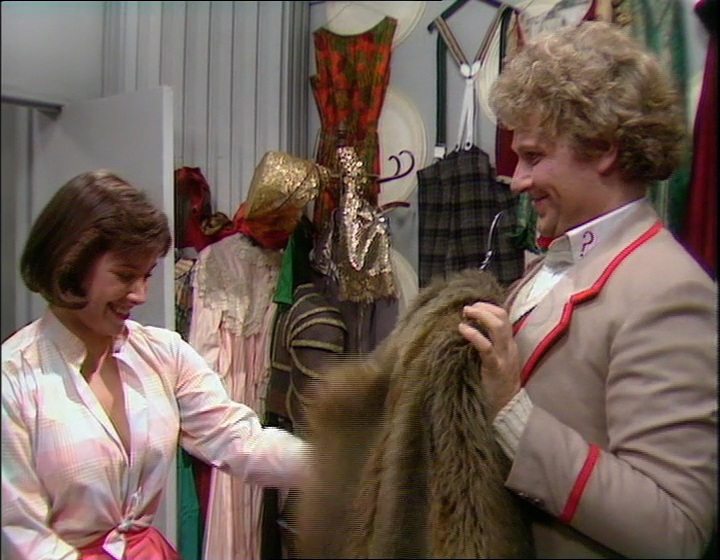 You can also see Tegan's fur coat from "The Five Doctors" (seen in the background as he's flicking through the rack), and what looks to be the Fourth Doctor's season 12 jacket (on the rack). I'm not sure if there are any other costume continuity gems hidden in this scene? 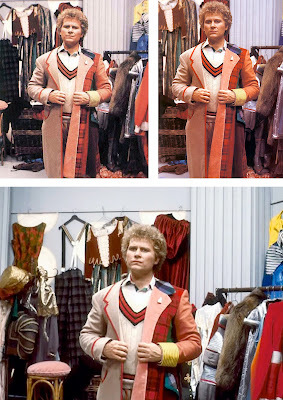 Looking at the photos of Colin having the two coats on, the 5th Dr jacket has no mud on the right hand lapel so must be publicity shots unless he did a quick wash. Great site.